Earth’s magnetic poles move constantly, but don’t seem to stray further than about 1,500 km from the geographic poles, and averaged over thousands of years, they roughly coincide with Earth’s geographic poles (figure above b). That’s because the rotation of the Earth causes the ﬂow to organize into patterns resembling spring-like spirals, and these are roughly aligned with the spin axis. At present, the magnetic poles lie hundreds of kilometres away from the geographic poles, so the magnetic dipole tilts at about 11° relative to the Earth’s spin axis. Because of this difference, a compass today does not point exactly to geographic north. The angle between the direction that a compass needle points and a line of longitude at a given location is the magnetic declination (figure above c). Paleomagnetism and how it can form during the solidification and cooling of lava. In the early 20th century, researchers developed instruments that could measure the weak magnetic ﬁeld produced by rocks and made a surprising discovery. In a rock that formed millions of years ago, the orientation of the dipole representing the magnetic ﬁeld of the rock is not the same as that of present day Earth (figure above a). To understand this statement, consider an example. Imagine travelling to a location near the coast on the equator in South America where the inclination and declination are presently 0°. If you measure the weak magnetic ﬁeld produced by, say, a 90-million-year-old rock, and represent the orientation of this ﬁeld by an imaginary bar magnet, you’ll ﬁnd that this imaginary bar magnet does not point to the present day north magnetic pole, and you’ll ﬁnd that its inclination is not 0°. The reason for this difference is that the magnetic ﬁelds of ancient rocks indicate the orientation of the magnetic ﬁeld, relative to the rock, at the time the rock formed. This record, preserved in rock, is paleomagnetism. 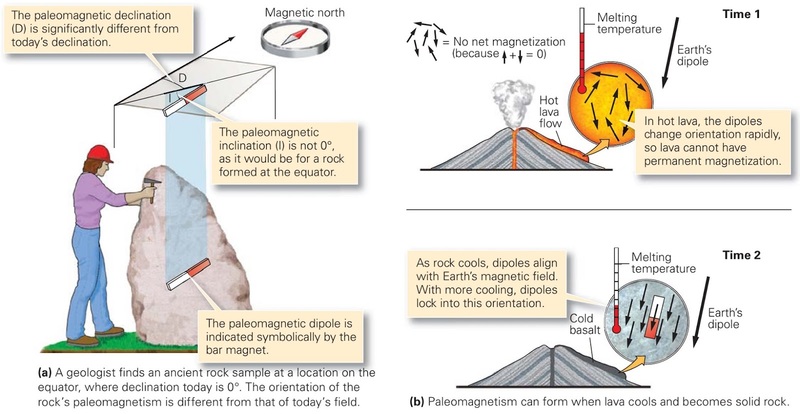 Paleomagnetism can develop in many different ways. For example, when lava, molten rock containing no crystals, starts to cool and solidify into rock, tiny magnetite crystals begin to grow (figure above b). At ﬁrst, thermal energy causes the tiny magnetic dipole associated with each crystal to wobble and tumble chaotically. Thus, at any given instant, the dipoles of the magnetite specks are randomly oriented and the magnetic forces they produce cancel each other out. Eventually, however, the rock cools sufﬁciently that the dipoles slow down and, like tiny compass needles, align with the Earth’s magnetic ﬁeld. As the rock cools still more, these tiny compass needles lock into permanent parallelism with the Earth’s magnetic ﬁeld at the time the cooling takes place. Since the magnetic dipoles of all the grains point in the same direction, they add together and produce a measurable ﬁeld. Apparent Polar wander paths and their interpretation. 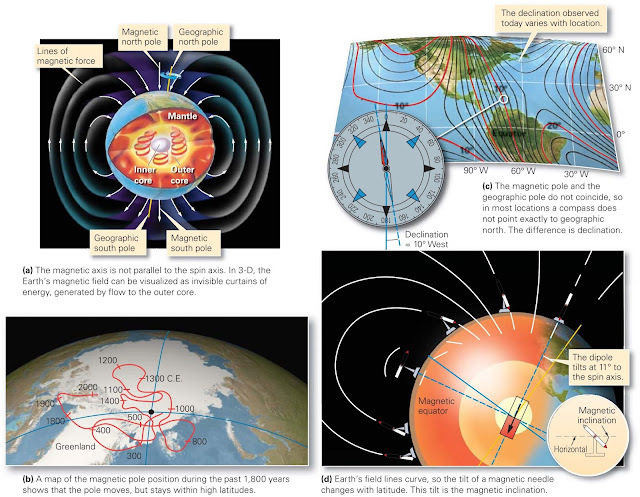 Why doesn't the paleomagnetic dipole in ancient rocks point to the present-day magnetic ﬁeld? When geologists ﬁrst attempted to answer this question, they assumed that continents were ﬁxed in position and thus concluded that the positions of Earth’s magnetic poles in the past were different than they are today. They introduced the term paleopole to refer to the supposed position of the Earth’s magnetic north pole in the past. With this concept in mind, they set out to track what they thought was the change in position of the paleopole over time. To do this, they measured the paleomagnetism in a succession of rocks of different ages from the same general location on a continent, and they plotted the position of the associated succession of paleopole positions on a map (figure above a). The successive positions of dated paleopoles trace out a curving line that came to be known as an apparent polar-wander path. At ﬁrst, geologists assumed that the apparent polarwander path actually represented how the position of Earth’s magnetic pole migrated through time. But were they in for a surprise! 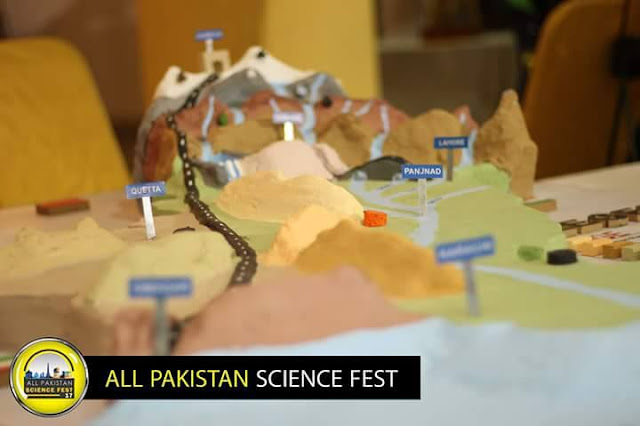 When they obtained polar-wander paths from many different continents, they found that each continent has a different apparent polar-wander path. 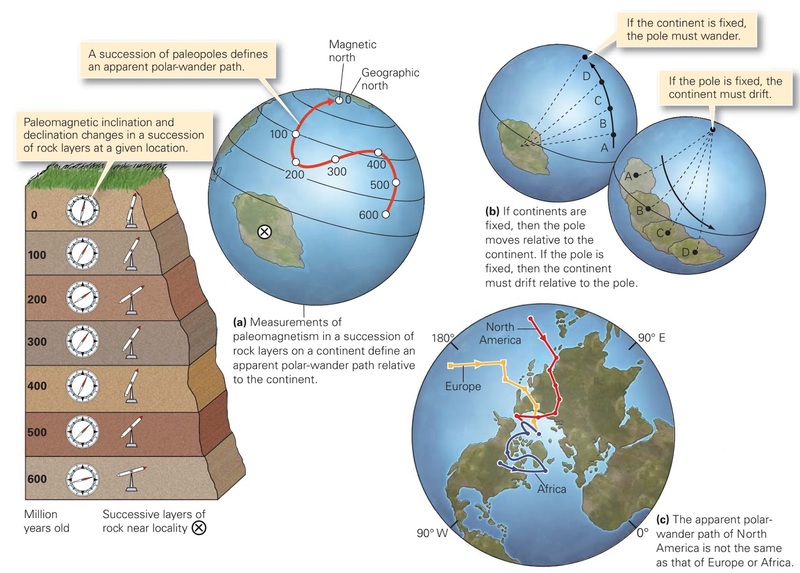 The hypothesis that continents are ﬁxed in position cannot explain this observation, for if the magnetic pole moved while all the continents stayed ﬁxed, measurements from all continents should produce the same apparent polar-wander paths. Geologists suddenly realized that they were looking at apparent polar-wander paths in the wrong way. It’s not the pole that moves relative to ﬁxed continents, but rather the continents that move relative to a ﬁxed pole (figure above b). Since each continent has its own unique polar-wander path (figure above c), the continents must move with respect to each other. The discovery proved that Wegener was essentially right all along, continents do move!